We provide the best Staffing Services to launch your career in the right direction visit our job placement services with no registration and free placement for candidates? BPO staffing is responsible for performing a process of a business organization management. outsourcing is done on cost optimization and gains in productivity. We are conducting Campus recruitment drives in various educational institutions, for providing job opportunities to the students, and pursuing their particular graduation. Our Consultancy is very responsive. Our job is not just to place candidates into related jobs and also we place people into their better careers. Sieve Softech has been into staffing services for the past 8 years, we understand that every company has its own culture, values, and expectations from its employees. It consists of several phases: Initial interviews, short-listing, informal reference checks, client interviews, and formal reference checks. We always in touch with the candidate until the time he/she joins the company. The successful joining for a specified job, we keep an ongoing dialogue with both the candidate and the client. We understand how critical to find the right employee with the right skill sets, Who can subscribe to the success of your business? Small business or a large corporate business, with your HR department, finding the right people is difficult. You need people with a certain level of experience, In a particular domain (or) in a specific location. 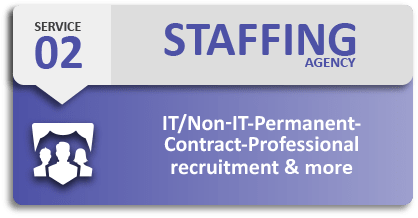 Our competent staffing services division will find people and explains the unique needs of your company. We have a completely developed recruitment & Staffing team, managed by an experienced management team. If it comes to staffing our company, needs a partner. We understand your business and can help maximize your performance.